I'm not sure how to execute it from workbench. After adding only JSON in request body I'm able to create file in sfdc but those files are empty, how to send data? You need to specify the Content-Type header that the example shows (given to curl with the -H flag) within Workbench, so that Salesforce knows it's receiving a multipart/form-data request body, rather than pure JSON. header so Salesforce doesn't try to parse the entire body as JSON, which it isn't. Not the answer you're looking for? 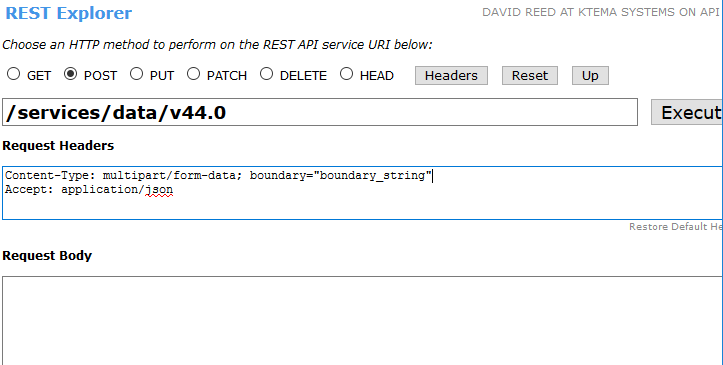 Browse other questions tagged apex rest-api rest rest-service or ask your own question.